A Favorite Clipper for shearing llamas and alpacas. Lightweight. Doesn't overheat as quickly as most shears. 3 Year Warranty covering all labor and parts for 3 years. This includes shipping your unit in for service! Roller bearings for drive sharft instead of bushings - less heat, less wear. Permanent rare-earth magnets enable more torque (power) and require less size and weight than ordinary motors. Motor fan forces air forward through the clipping head. 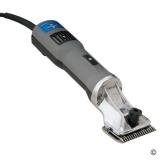 Shorter in length; weighs less than most other clippers; smaller grip surface! Premier 4000C Clipper only. (Blades not included). Free Standard Ground Shipping within the Continental United States! To order extra blades, Click Here, shipping on extra blades will be deduced if ordered at the same time as the clipper. To order a clipper sleeve, Click Here, shipping on the sleeve will be deduced if ordered at the same time as the clipper.